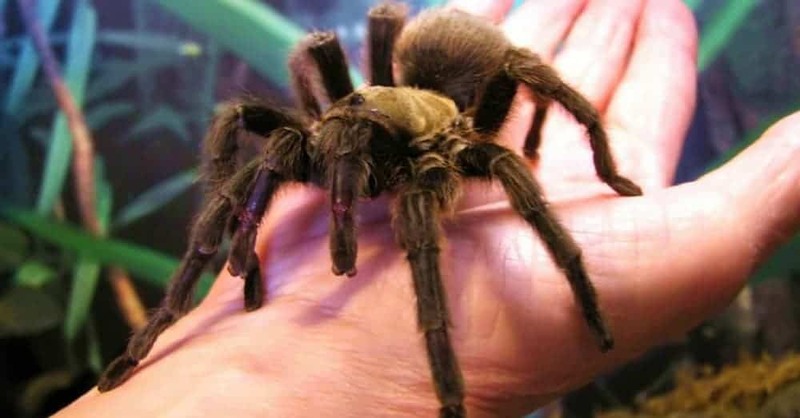 One of the common bites that occur across the world is that of a spider. It may be a harmless spider, or it may be a poisonous one. Identification of the spiders is a key in helping to determine what kinds of treatment will be suitable. In this article, you will find out how to identify them, what are the symptoms when bit and how to treat the bites each kind of the common spiders. However, whatever the treatment is, it must be approved by the doctor. And when bit by a spider, you are highly advised to see the doctor immediately. 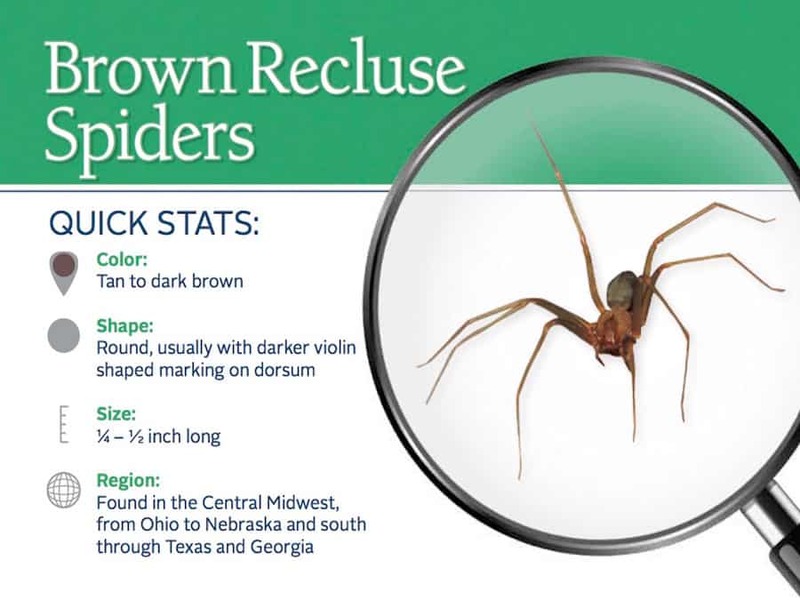 Also known as the brown fiddler, fiddle-back spider, and violin spider, Brown Recluse makes people think that they can identify them by the violin shape on its cephalothorax. Instead, it will be easier to identify them by looking at the 6-eye pattern in pairs with a space separating the pairs. Bron Recluse are small, but they are deadly. Their fangs are tiny but are sharp enough to pierce flesh. The spider’s jaws open sideways and close tightly to pinch into a victim’s skin so they can inject a toxic cocktail. Living habit: Woodpiles, sheds, closets, garages, cellars and other places that are dry and generally undisturbed. The bite site is red, and tang marks are seen when looked closely. The wound is dark in the center, surrounded by a reddish area with a whitish separation, which creates a “bullseye” pattern. Bite symptoms: Severe pain at bite site for about 4 hours, Itching, Nausea, Vomiting, Fiber, Muscle pain, Blistering, Death of skin. Use acetaminophen for pain relief. Seek a help of a physician for tetanus immunization, pain medication, and removing dead tissues in infected areas. 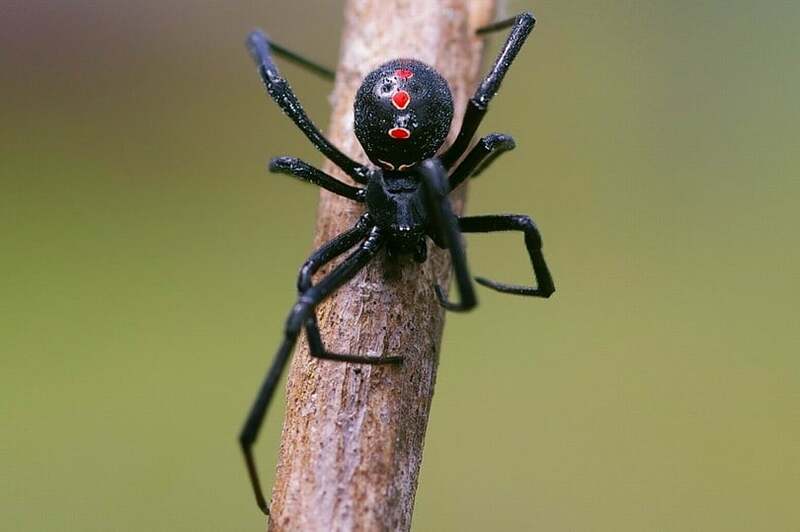 Also known as Latrodectus Mactan, Black Widow is such a popular spider that it needs just a few introduction. Such terms commonly position it as deadly mating, cannibalizing the male companion and being as venomous as 15 rattlesnakes. But please note that only the females have the ability to inject venom. Black widows are also very non-aggressive. Using their built-in chemical wall, they bite only when they feel threatened or defending their instinct. Appearance: The females are jet black, shiny and about 1/4 inch long. They have a very distinct, red, hourglass shape on the underside of their abdomen. However, the males are half as large as the females. Living habit: They prefer shades or dark, dry and sheltered areas. Keep an eye on them in outhouses, dense brushes and sheds. Its scientific name is Tegenaria Agrestis. A lot of people see the word “Agretis” and assume that it means aggressive. In fact, was named by the scientists of Paris-based National Journal in 1802. And Agretis in Latin means on the field. Back when these spiders live in Europe, they liked to live in the fields, far away from human population. However, when they are found in the America, they did not take the same type of the environment that it took it its European home. They become a common house spider. But, they are likely to attack only if they are provoked or threatened. Appearance: This spider is about 1with 1/4 to 5/8 inches in length. It is brown with a distinctive pattern of yellow marking on its back. These spiders are very poor climbers but are very fast runners. Living habit: They prefer to live in rarely undisturbed places. Such places can be behind and under the furniture and cupboard, in the attics, storage house, basement, and closet. Bite identification: Bitten area is surrounded by an expanding red well that can reach 5-15cm in diameter. A scab develops over the necrotic tissue. The bite can be completely unnoticed. Bites can cause severe headaches that last for many days. A necrotic wound way may develop. To prevent the spread of the venom, do not move and avoid touching the affected area. The Yellow Sac Spider is small, and its venom cannot leave a severe injury to the human. However, a bite from Yellow Sac Spider can leave a world of hurt. They only bite when harassed or provoked. Treat them right and they can become a helper in your house as they can be an insecticide from nature. 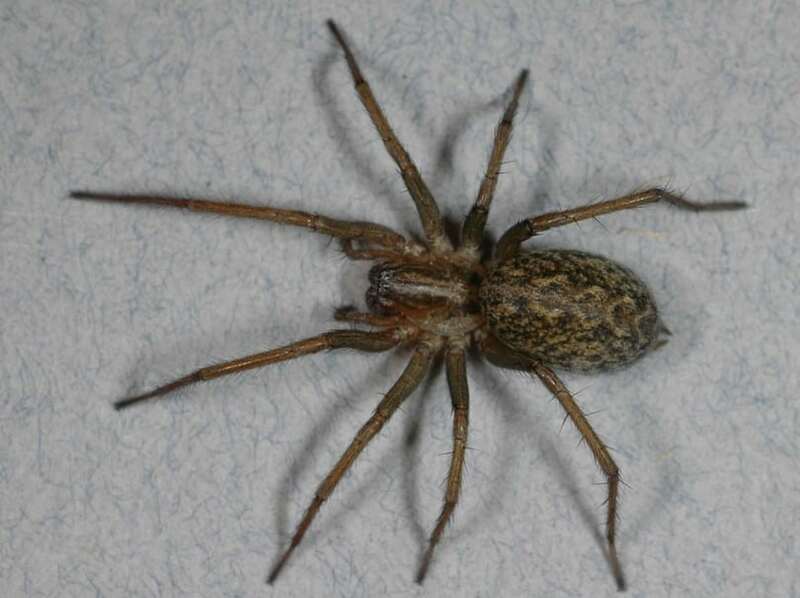 Appearance: These spiders are often misidentified with Brown Reclus spiders. They are tiny, about 1/4 inch to 3/8 inch long, with no conspicuous markings. Their front legs are longer than the rest of their body. They are very pale in color and can be yellow, greenish and tan. 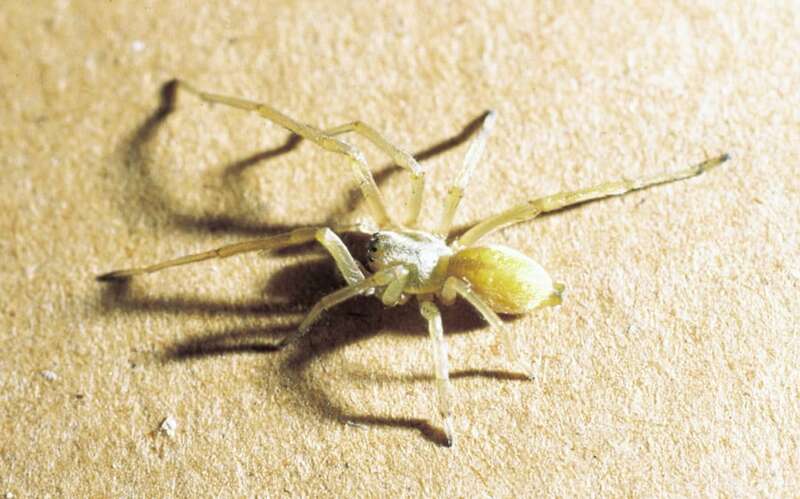 Living habit: The Yellow Sac spiders hunt out in open at night. In the morning, you can rarely find them, but at night, they sprint after prey in the grass or around the house. Bite symptoms: A stinging sensation would be common. Also, the bite can make the victim feel slightly sick. 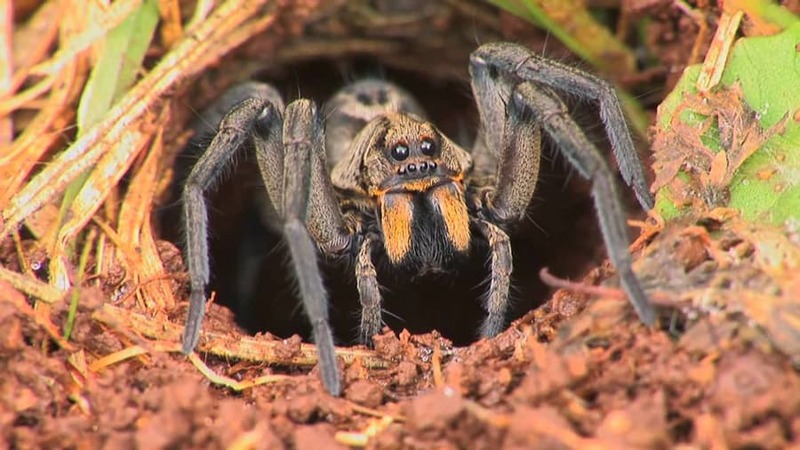 Not many people are reported with Wolf spider’s bite. However, it is still highly advised to stay alerted for these spiders. You may trample them while walking on your lawn. And their bites can cause an extreme hurt to your body. Appearance: They have a large abdomen and long cephalothorax. Their size is usually 3 inches in width and 4 inches in length. Living habit: It is commonly found in the garden or deep down in the basement. A tear in the skin, redness and swelling. Kin area at the bite may turn black with the same sort of necrotic lesions as brown recluse and hobo spider. Sensation ranges from mild skin irritation to muscle pain. Take acetaminophen or an antihistamine to reduce swelling. You can make a paste of 3 tsp of baking soda and 1 tsp of water. Mix it well and then apply directly on the affected area. Apply this paste once in every 2 hours. If you have redness and swelling on the bitten area, you can apply this paste on. Turmeric is load with analgesic and anti-inflammatory properties. This remedy will offer a visible result with a few hours of application.You can also grind fresh turmeric pieces and mix them with the Olive oil. Take the oils in the same ratio and applied on the infected area. These herbal oils have curative and anti-venom properties, which can reduce the pain, itch, redness, and swelling. While some spiders are harmless, some others are poisonous and aggressive. It is still important to avoid having any interaction with them. Whenever a spider bites you, identify the bite, watch the symptoms and treat the bite as fast as possible. If you are not sure about the bite, It is always highly advisable to go straight to the hospital. It is the safest way to keep you away from any further damage or even fatality.